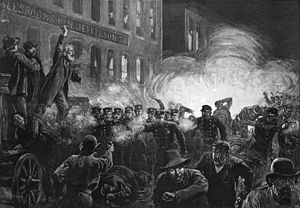 This 1886 engraving was the most widely reproduced image of the Haymarket affair. It inaccurately shows Fielden speaking, the bomb exploding, and the rioting beginning simultaneously. ↑ "Originally at the corner of Des Plaines and Randolph". Cityofchicago.org. पहुँचतिथी 1 मई 2016. ↑ "इतिहास में आज: एक मई". dw.com (Hindi में). पहुँचतिथी 1 मई 2016.